I made my first trip to California for QuiltCon a couple weeks ago and this happened...Casting Shadows, my Michael Miller Our Yard Fabric Challenge placed 2nd! It all started with this bundle I received back in August 2017. Without a plan, I was instantly drawn to the stripe, thinking it would make a great binding. I also liked the Lime Tree Leaves in Robin. I thought those little trees were cute too. I had so many ideas for the challenge, I had a hard time choosing what I would make. The months flew by and I had to make a decision as it was getting down to the wire. 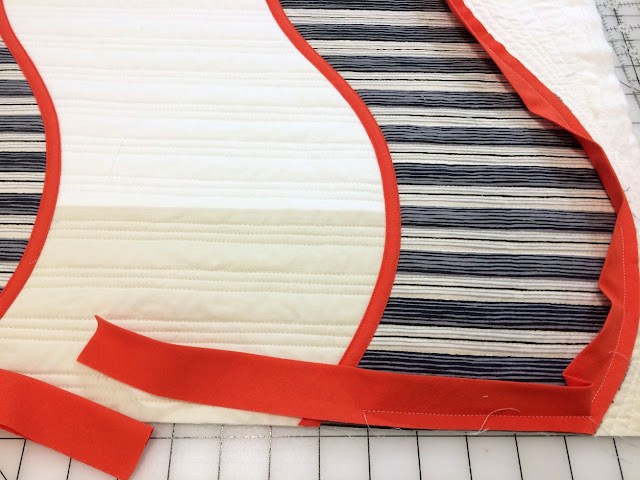 Knowing I liked the stripe, I had ordered a half yard thinking I would use it for the binding from Morning Star Fabrics. I ordered Cotton Couture in Ivory twice from Add Thread. I decided to use the Quick Curve Ruler once again. But would my idea work? 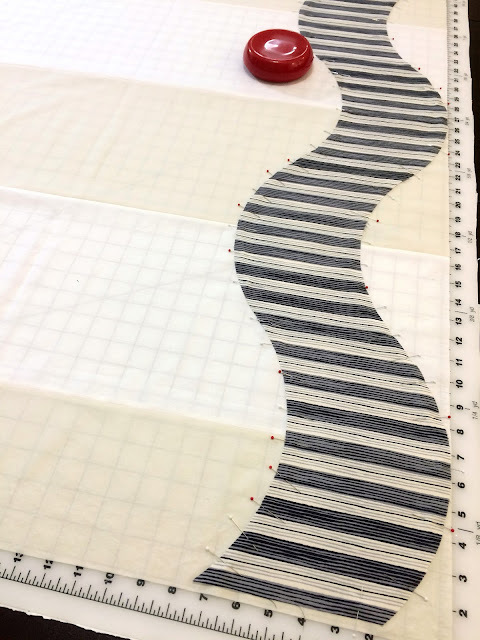 After some careful measuring, cutting and piecing, I auditioned the pieced curved strips on the design wall for spacing. Next, I auditioned itty bitty bias strips for placement. Should I add a third strip, or leave it at two? You can see I decided not to add the bias strips to the blue section. 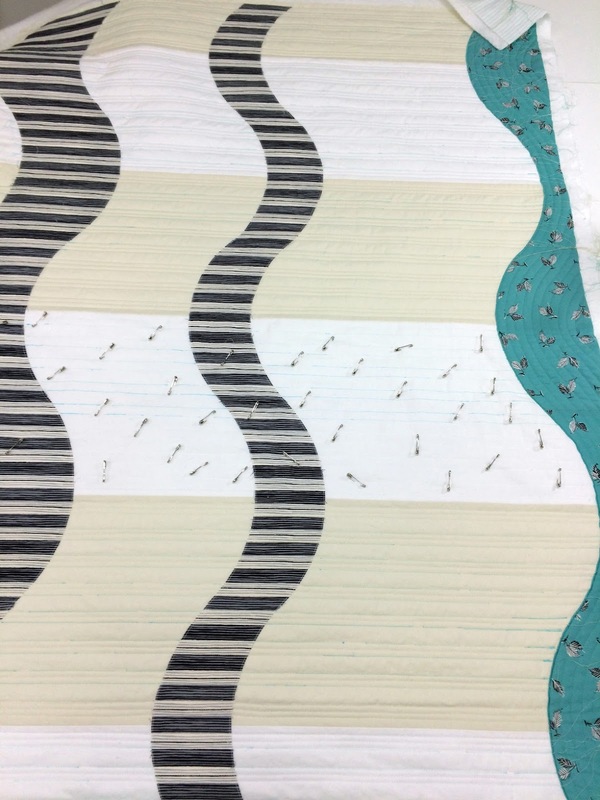 I used every pin to secure the strip to the background before stitching. 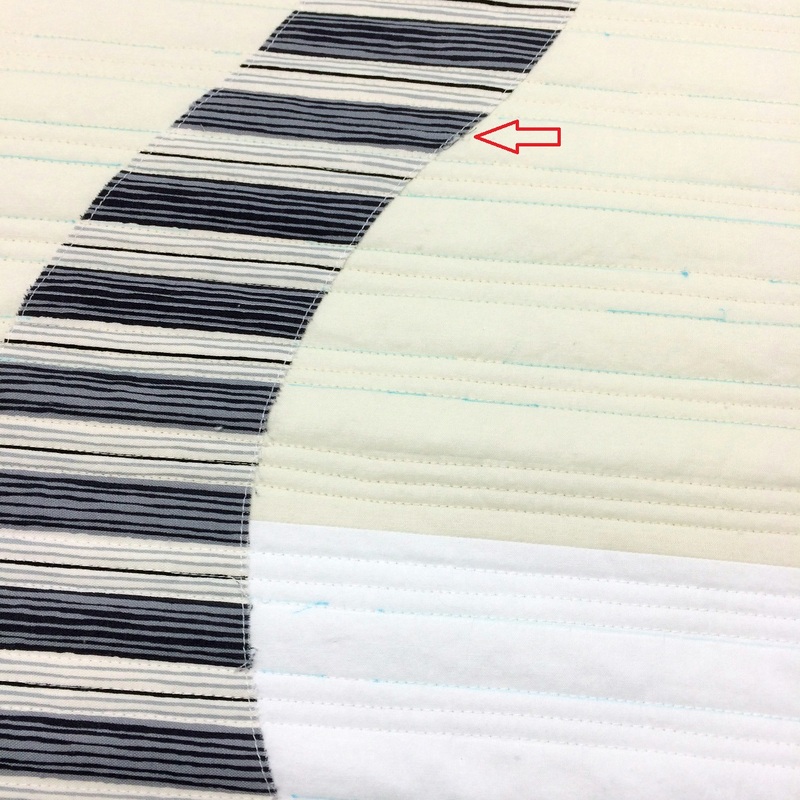 After securing the striped strips, I zig zag stain stitched the blue in place and was ready to begin the quilting. 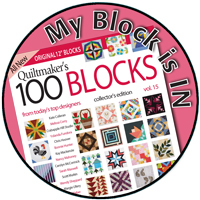 I used Aurifil 50 wt for the applique and the quilting. Here you can see where I secured the strip to the background using the walking foot since the seam would be covered by the bias tape. 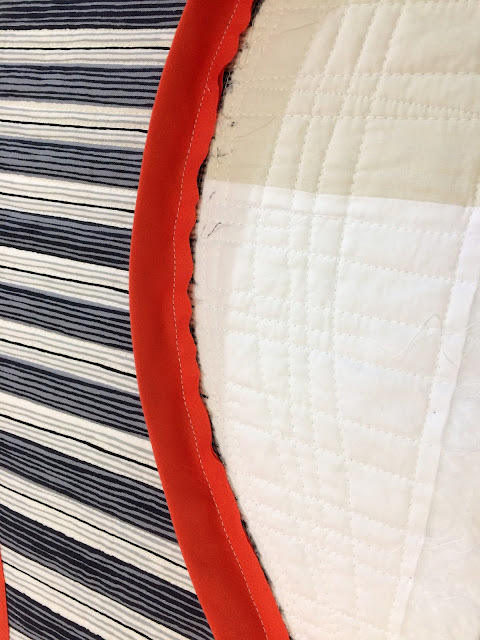 While the curved strip may look like a continuous strip, it was actually pieced. The arrow indicates one of the seams. And here, the quilting has begun. The quilting is almost done, one more section to go. Here it is all quilted and blocked. You can see I left the right side intact as I had planned to add a curved edge and figured it would be more stable if I did not cut away the curves. Nothing like making the challenge more complicated than it was already. I first added the bias tape which I had done before. I decided to use the Robin for the binding on the the left side and actually made it from a fat eighth. In fact, all the blue was pieced and bound from fat eighths given to me from guild members. I decided to change the binding color to match the curve. 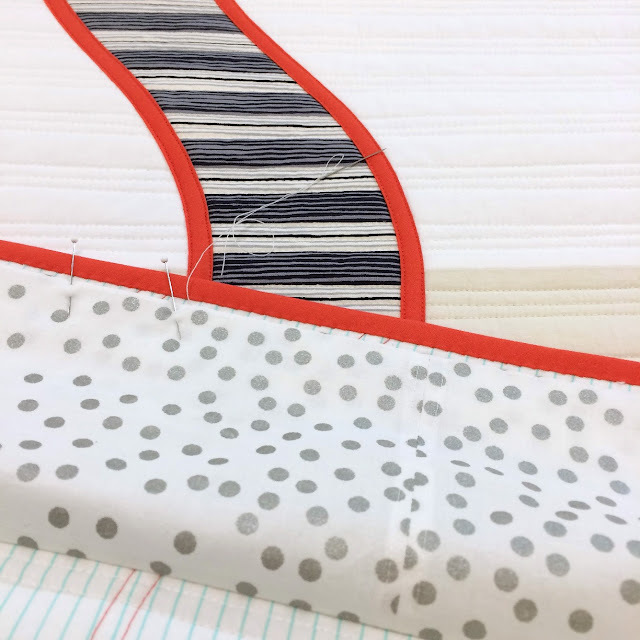 I actually blindly cut the binding strips, pieced it to the orange and hoped for the best as the seam was so close to the corner, I couldn't actually turned the corner and then cut to size. But it all worked out the first cut on both the top and bottom. I saved the curved edge for last. Here we go, let's hope for the best! I pinned very carefully, not wanting to pull the bias binding too taut. I carefully stitched using the walking foot. I made the final join and then carefully trimmed away the excess. I'm proud to say, the my challenge was made entirely from Michael Miller fabrics, right down to the hanging sleeve. Remember this fabric from the Glitz challenge a couple years ago? I thought I would never return to it again. I was thrilled when Casting Shadows was juried in the show and even more ecstatic to learn it had placed 2nd in the challenge. 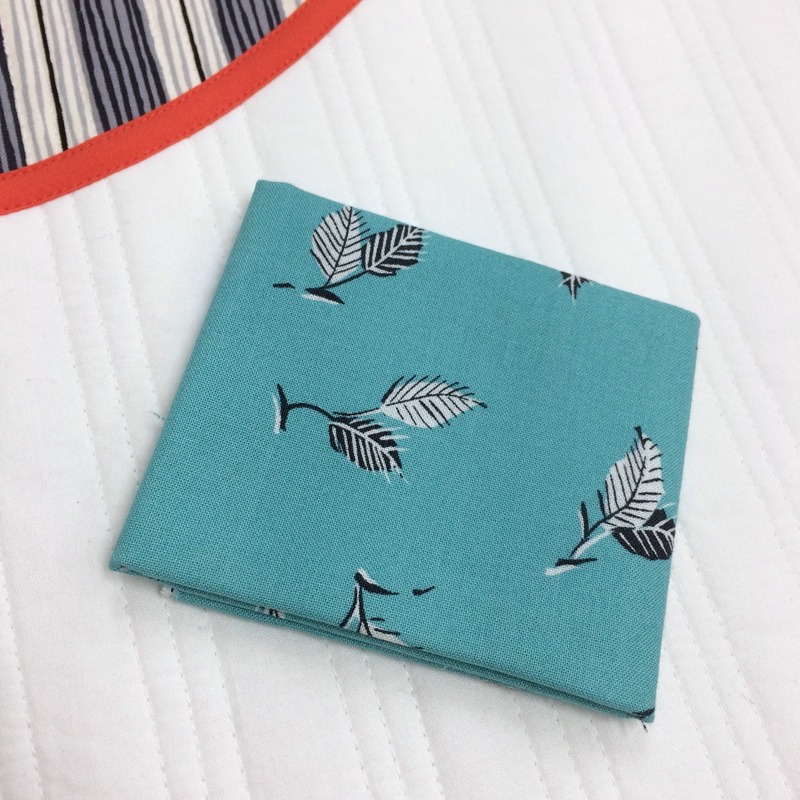 It's no secret, I love a challenge...here's my first Micheal Miller Spring Cotton Couture fabric challenge from 2015, After Dinner Mints, which also placed second and again, I used the Quick Curve Ruler. And this is Barcelona, my Michael Miller Glitz fabric challenge from 2016. Once again, I used the Quick Curve Ruler in an original design. 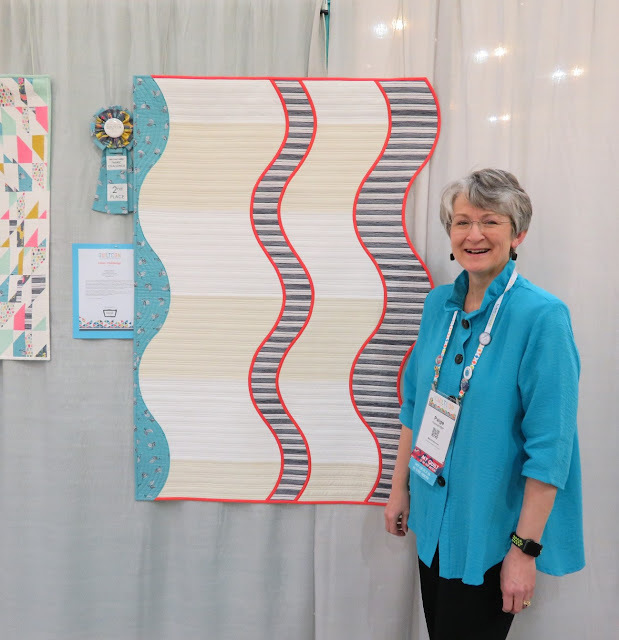 You can see all the award winning quilts from QuiltCon here. 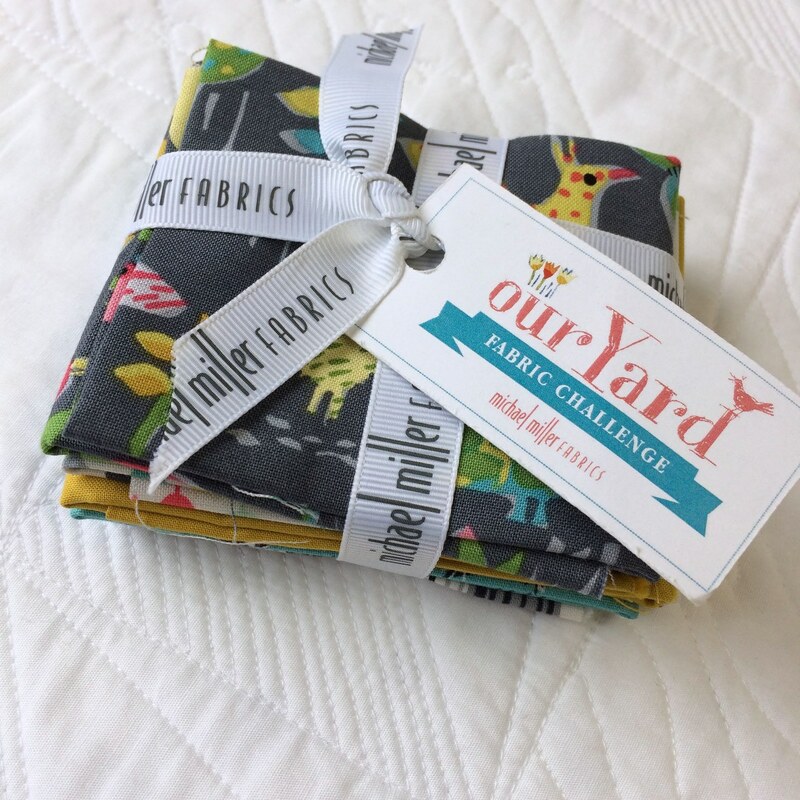 You can see the Our Yard Challenge winners and other challenge quilts entries on the Michael Miller blog, Making It Fun, here. Linking to Finish It Up Friday with Amanda Jean at Crazy Mom Quilts and TGIFF hosted this week by Sherry at Powered by Quilting. Congratulations! I love the curves, especially the curved edge! This may be a repeat comment. Google was acting up earlier. Your piece is magnificent! Congratulations on your ribbon. Thanks for walking us through your creative process. I enjoyed it very much. Congratulations, Paige! The quilt is stunning, and you make the process look so easy. 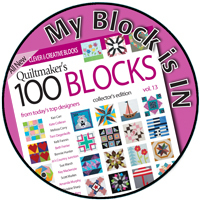 You are living my dream, so I enjoy seeing what's going on in your quilty world! I love everything about this, Paige! 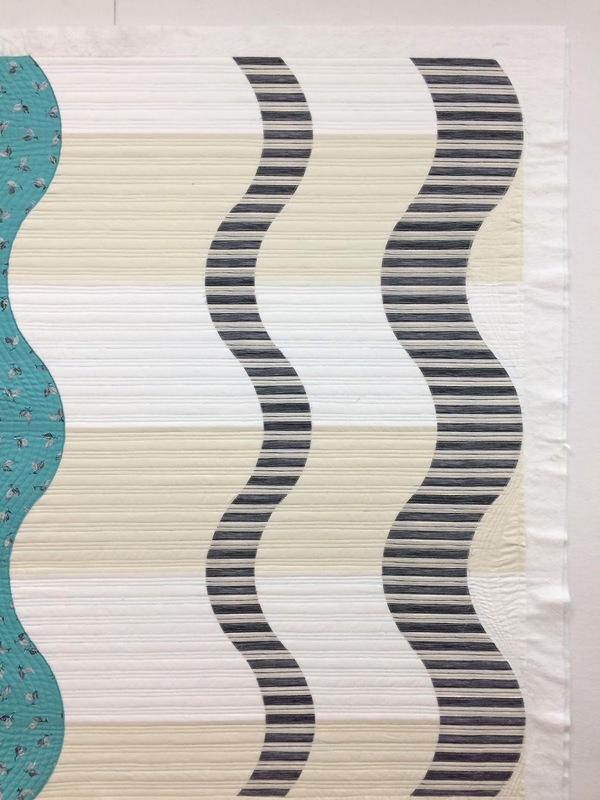 The curves, the quilting, the curved edge and the colour matched binding...it adds up to an amazing quilt. Congratulations on the ribbon! congrats! Love the quilt and you well deserve the win. Where could someone find info on the next challenge? Paige Congratulations! This is a beauty. I love the curves and could never imagine being able to think this pattern up and then being able to execute it. Great job! Congrats Paige! Looks great and those red edges are perfect! It turned out beautifully, Paige! 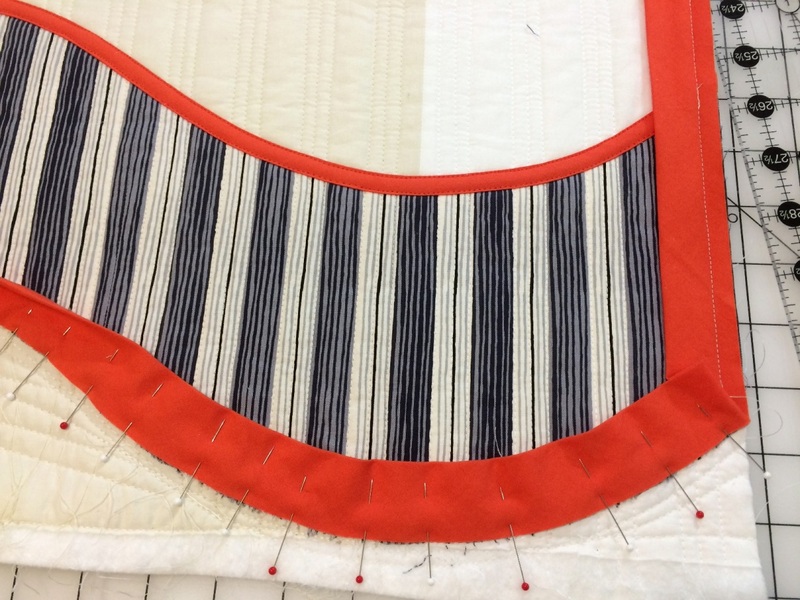 I do love the curved edges on the right hand side and your careful attention to details like pattern matching when piecing the stripes together. I love this quilt. What a good idea on the construction and the bias tape. It all works and rally is lovely. Pattern matching is always worth it on these kinds of quilts and that touch in the binding is always a winner! Congratulations. 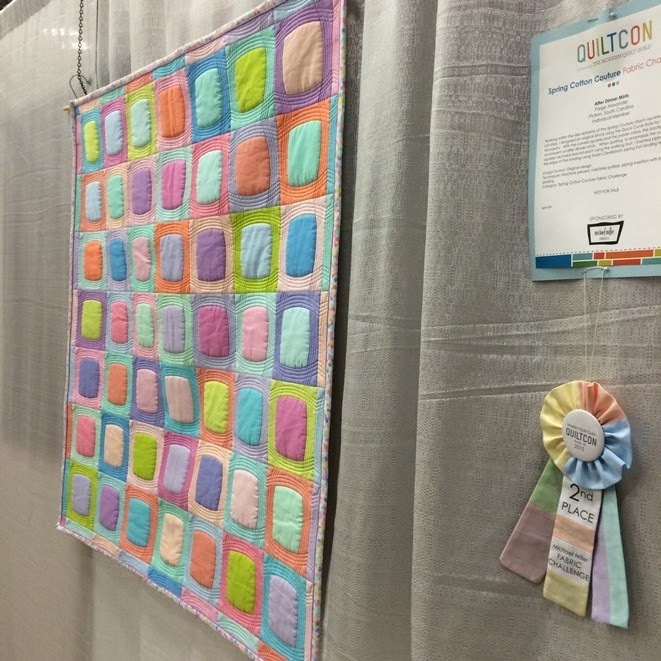 What a fun quilt--congrats on your ribbon! It's always great to see the process--very interesting. I love all the little details right down to the binding! Congratulations, Paige! All your hard work has paid off! I can see that you are always up for a challenge. Congratulations Paige. 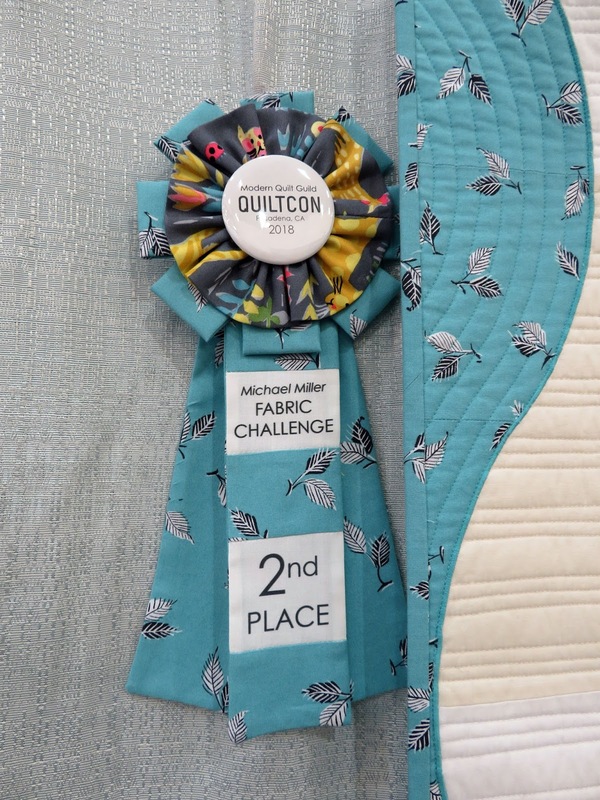 I was so excited when I recognized your quilt in the photos of the winning quilts. It is a beautiful and very unique quilt! Congrats! This is a wonderful piece - love the curves, the value changes in the cream, and the matching binding - great work! Lovely and creative quilt design, especially, the curved edge. Congratulations! 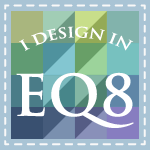 Thanks for sharing your design process. Stunning from go to whoa!!! 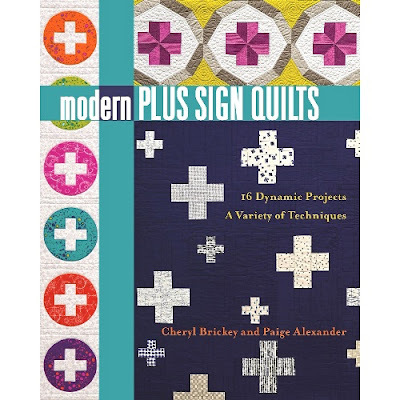 The curves are so detailed, the edging makes them stand out just as they should, and then the binding. Many, so many congratulation wishes. Paige it is fantastic. Curved piecing like this and applique are way any out of my league, but they are so beautiful. Did you publish After Dinner Mints, because I would love to purchase it. Looks like a fabulous baby quilt. I loved your quilt!!! So awesome!!! 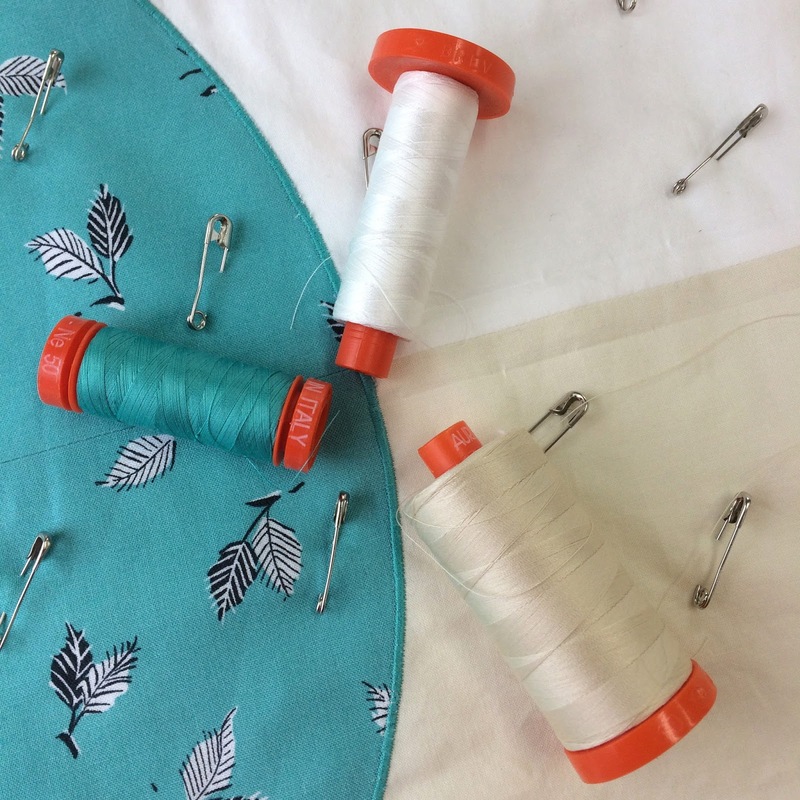 I like how you did the curved applique, I'll have to try that method! Great post! I love seeing the in construction pictures. Congrats on the much deserved win! Thank you so much for showing us your creative process, Paige! 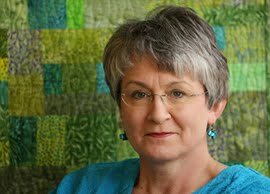 Casting Shadows was my favourite Quiltcon quilt, and I must say the thoughtfulness you’ve put into it was evident, and had me totally fascinated as I was drawn back time after time to look closer. It’s so restrained and elegant, and the perfect curves are a feast for the eye! Congratulations on this stunning quilt! Congrats! I love the curves and the detail with the binding. Congrats! Thanks for sharing your method. 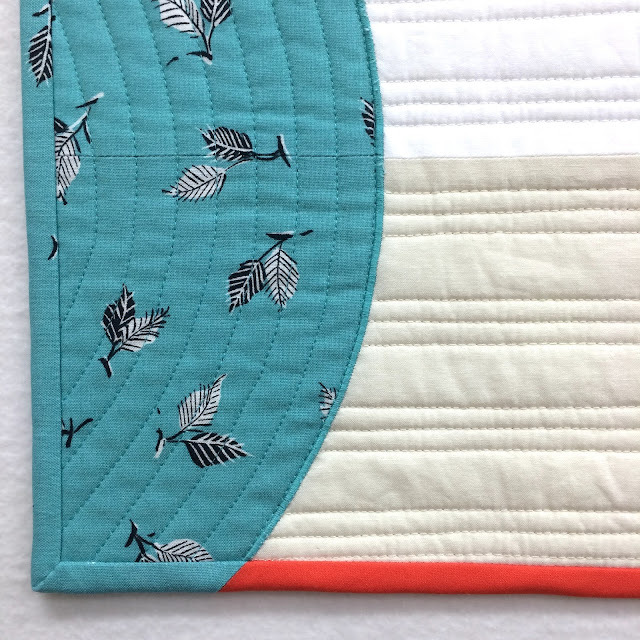 Big Kudos to you for your amazing quilt; it's lovely to look at but my head is spinning from reading the details on how this quilt came to being. WOW, you have skills! 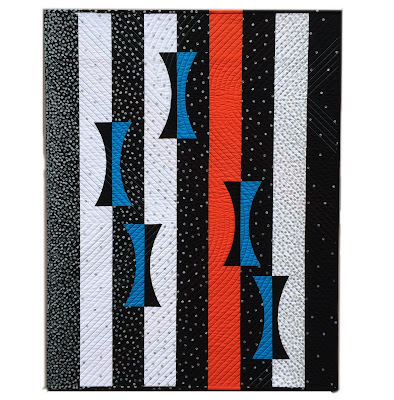 I love that you used the blue print with the black and white stripes. 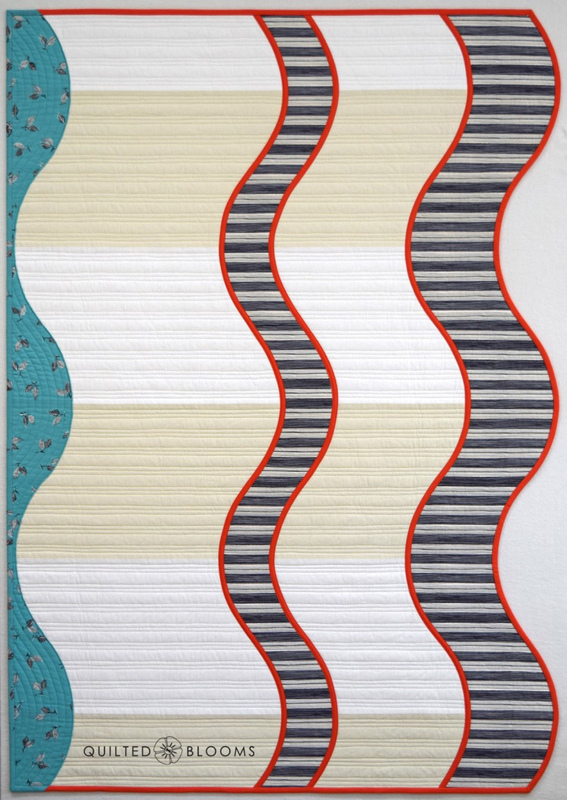 And this quilt really moves. Another great quilt and you do challenges well, very well. 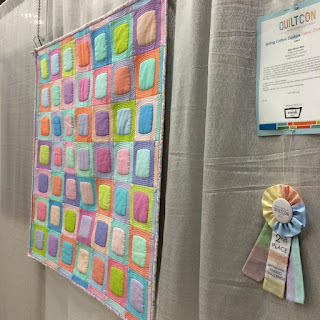 I loved seeing your piece at QuiltCon. It has such a 3-D effect. Thanks for sharing your process behind this stunning piece! And congrats on your ribbon!! 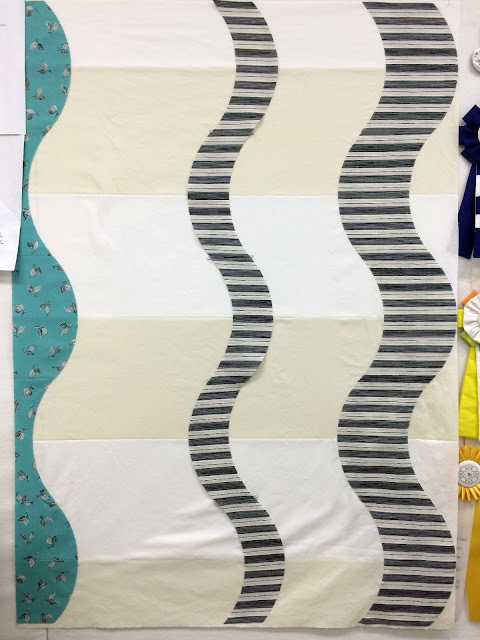 Congrats on placing with this quilt, Paige! The techniques are amazing! You have certainly made use of the QCR! 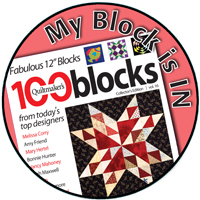 I have decided this year - actually next project- is the year I'm going to attempt curved blocks. I feel weirdly confident that I can do it but time will tell! I can't believe after dinner mints is pieced! Congrats on the win. It's a great piece. Congratulations to you. The quilt is very pretty and colorful. Your designs are always so modern and fresh. 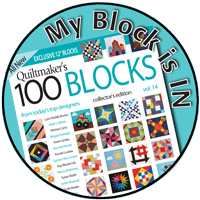 Paige, it has been so fun to watch you quilt. You are amazingly talented. Congratulations on yet another well deserved award! 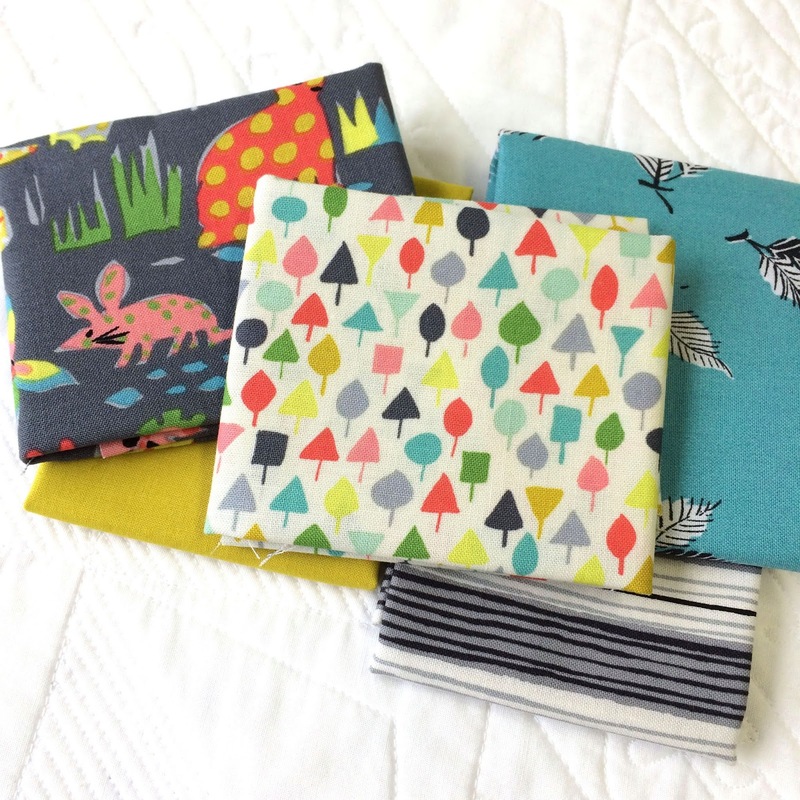 Looking forward to the start of your book blog hop! 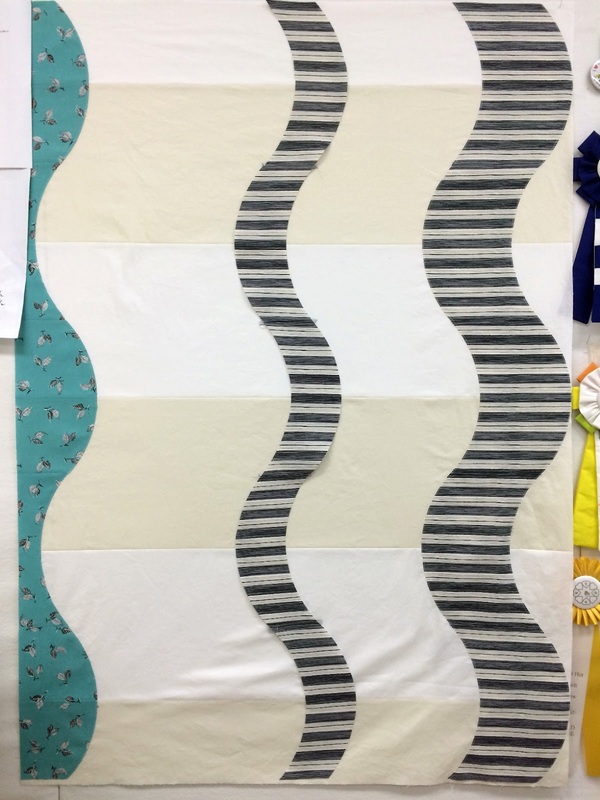 Paige, this is one of my most favorite quilts of all the winners you've made. 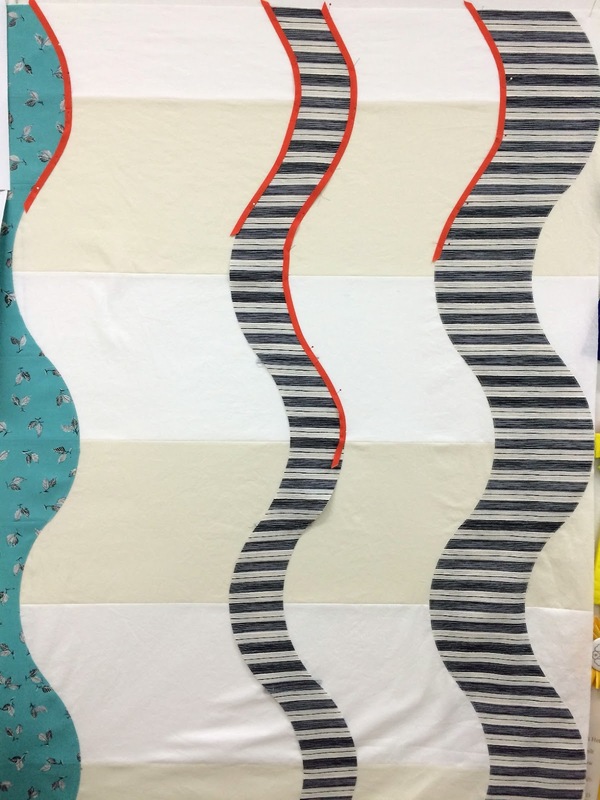 I'm sure I've showed a picture of you with your quilt (as seen on IG) to at least a dozen friends, marveling over the way you used that not-very-pretty-fabric, to make an incredible design, and the way the background and wavy-edged finish make it look dimensional. You truly outdid yourself with this one, and I'm only wondering why it didn't take first place! It's simply fabulous!